Skiing was invented in China. Together with gunpowder, the printing press, golf, football and pasta, China has added skiing to its list of world firsts following archaeological “evidence” that supports skiing having started amid the peaks of Xinjiang 100-200 centuries ago among Stone Age Kazakhs. It’s taken a while to get going since those early days depicted on cave paintings in the mountains of Altay in the far northwest, but the last ten years have certainly seen turbo-charged progress. From a bunny-sloped backwater just a few years ago, the region has been rapidly transformed into the province chosen to hold the China Winter Olympics next year. There’s talk too of course of China itself contending for the World Winter Olympic Games in 2022. Whether or not it achieves its aim, there’s no doubt that when China puts its mind to something, rapid progress is never far behind. When my husband and I first arrived thirteen years ago, skiing was a peculiarly Kazakh-run pursuit. Given that they invented the sport, this was only to be expected. The slopes were little more than snow-covered slag heaps at the edge of the city. Wild-looking horsemen swathed in animal skins and Ghengis Khan-style fur hats doled out the ex-Swiss skis and boots from a yurt at the foot of the slopes. To keep warm, we would huddle every few runs around the wood-burning stove in the center of the yurt. As midday approached, the smell of homemade fried rice and mutton wafted up the hill. We would drift gratefully back to the yurt to dive into the national dish and warm our sodden feet and hands over the embers. On a weekday it was a treat in the early days to leave work at lunchtime, take the number 104 bus to the end, and be on the “slopes” by early afternoon. There was just time for a couple of hours skiing before dense pollution completely obliterated the person in front, making any movement downwards untenable. In those days skiing was an all-inclusive mere dollar or so an hour. It was quite possibly the cheapest skiing in the world and well worth even those brief hours. Skiing repeatedly down the same tiny incline was never much of a challenge, especially after one had experienced the French Alps, but the most exciting part of the day as far as I was concerned was always the trip back to the top. Bobble lifts and ski tows of any description had yet to grace these “pistes.” The only way back up the hill was holding a horse’s tail for dear life as it raced other horses to the top. No one was ever quite sure they would reach the top in one piece. Because no one really knew how to ski, the slopes were peppered with flailing bodies. Kazakh horsemen were carefully placed at intervals along the runs to rescue casualties and would rush to their aid. Every now and again some poor novice would be manhandled off the slopes on a stretcher and taken to a local hospital. It was always a good idea in those days to take out the local insurance since the elderly boots and bindings were never completely guaranteed to release in an emergency. Not that the 50 cent policy went very far towards a broken leg even in this the remotest province of far west China, so we always tried to stay upright as long as possible. In the early days, skiing was not an exclusive sport and certainly never only the province of the rich. The modest fees are still pretty much within the reach of anyone with a job and taking to the ski fields with groups of friends has rapidly become the thing to do at weekends. It wasn’t long either before it became a popular outing for courting couples. With no such thing as ski suits or special attire, girls would turn up in mini skirts and the guys in shirts and ties and off they would go. The have-a-go pairs would point their skis downwards from the top of the run and steel nerves would propel them to the bottom, their clothes flapping in the wind. The girls would usually come to grief half way down, whereupon boyfriends would embark on a noble rescue mission, emerging at the foot of the slope dragging girlfriend and both sets of skis and poles behind him. These days, it is not unusual for a work unit to surprise its employees on arrival at the office or factory with the news that the team-bonding exercise that month will take place on the slopes. The be-suited employees and trendy office girls take the treat in their stride and tear off down the pistes in groups of forty or fifty, screaming with simultaneous laughter and terror. When ski tows appeared about three years later, it took a while before people got the hang of the newfangled contraptions. The mangled mess of bodies littering the edge of the runs became a lethal cocktail of booby traps that usually only the most highly experienced were able to avoid. There was always more danger from AWOL skiers and tentative bobble-lift passengers than there ever was in trying to negotiate a nursery run. These days the madcap horsemen have all but disappeared leaving a more benign version willing to give pony rides around the block for a few Yuan. Ski tows, chairlifts and moving platforms have replaced them and for those not willing to wait their turn, motorized snowmobiles will whisk the rich to the top of the slope for significantly more money than our four-footed friends used to. The latest ski suits and snowboarding outfits have replaced mini skirts and suits and ties, and bona-fide instructors charge through the nose for half an hour of their time. The mountains of Xinjiang these days are a gigantic business opportunity waiting to happen, given that the Tianshan peaks running through Central Asia are some of the highest and most spectacular in the world and there is more money here than there has ever been before. But corruption at the highest levels has hampered all but the best-connected and many ventures have fallen at the first hurdles of nepotism that run through every lucrative business venture wherever you are in China. When it comes to creating ski resorts—without heavy government support, palms greased and vested interests sated—no project survives. The compulsory purchase of ancient Kazakh lands, and large-scale development of mountains that so far have been the preserve of those very same nomads needs special handling. And besides, other priorities fill government heads in this section of China, one of the country’s least developed and poorest regions. Most of Urumqi’s skiing stretches along the base of the South Mountain range in a series of tiny independently run “resorts” whose slopes range from almost flat to barely undulating. In other words, they’re perfect for beginners. 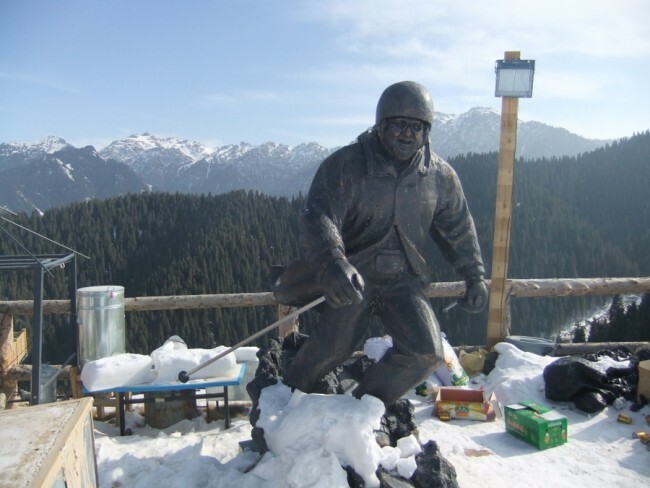 But apart from the slightly hillier Urumqi golf course, which is transformed into a ski resort in winter, and the mountains of the Heavenly Lake nature reserve, which now boasts a couple of runs, the area’s other main success story is the aptly named Silk Road Ski Resort. The project was the brainchild of a wealthy and well-connected ski-enthusiast who became hooked on the sport in the fields of Europe and was determined to have a go in his own homeland. He has done so well in the space of a few years that his “baby” will be the base from which the All-China winter games will be organized next year. What started out as a single slope for beginners and intermediates with a few lifts has already fanned out across the mountain into additional blacker than black runs, which drop precipitously down the length of four valleys. A mere four years ago when they were first opened no one was equipped to tackle the incline, but now the slopes are full of accomplished skiers and potential champions. Just as with pretty much anything, the Chinese put their hands to these days world-class excellence in the sport cannot be far behind. The resorts’ growth and the skiers progress is exponential, and before long there will be a line of champions bred from this very soil. And who knows whether the next generation of Olympic champions will have been spawned on these very slopes. The slopes indeed that bred the world’s very first skiers, all those thousands of years ago. Ruth Ingram is a writer living in China. She has also written for The Guardian.